This ring is a mix of classic style with new age design aspects within the jewelry industry. 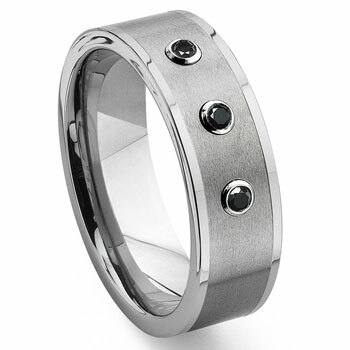 Made of high polish tungsten with a satin finish on the top surface featuring three black diamonds with VS1 clarity and 0.10 carat total weight mounted in stainless steel bezel settings on the surface of the wedding ring. We offer this band with a 100% lifetime warranty, which also includes the gemstones. Our tungsten rings are one of the strongest metal rings one can purchase. It is scratch proof, wont fade or tarnish, and will not bend out of shape, or break.